If you’re new to golfing, you may wonder if there are differences in the way you should grip different clubs. The answer is…maybe. It depends on the situation and your comfort level. Most people, however, find that the most difficult club to figure out how to grip is the putter, and with good reason. As a beginner, we usually start out gripping the putter the same way we grip our fairway clubs, with an interlocking grip, but that doesn’t always give us the best sense of control and confidence, and can feel quite awkward. All of these grips have their strengths and weaknesses and there is no one right way for every golfer or even every shot. You need to decide how to grip a putter based on your comfort level, sense of control and oftentimes even the circumstances (the lie of the ball, distance from the hole and/or direction of the green). Below I will show you how to grip a putter using the most popular overlap putting grip, which feels more comfortable, gives you more freedom, and is less restricting your movement. To best understand the explanation of the grip, you must first understand the terminology. ​Lead Hand – This is your weaker hand (left for right-handed golfers, right for left-handed golfers), though it should dominant hand of your swing. Whatever you do, be sure to try the putter in the golf store or ask a friend to borrow theirs for a round of golf to ensure that you like the feel of it. Grip the shaft with the remainder of the finger from the trail hand, this time with the fingers creating a fist facing down. 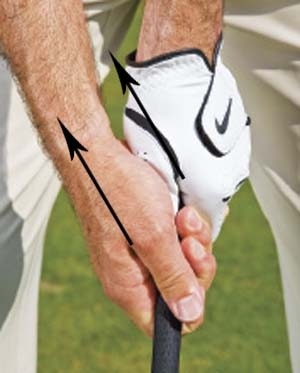 Place your trail hand thumb over your lead hand thumb so that they both form a straight line down the shaft of the club, pressing down lightly. Putting may be one of the most difficult parts of golf, but learning to putt well can shed strokes off your game and make the difference between an enjoyable afternoon of golf with friends and a game that will make you want to throw your clubs in the water hazard. If you follow these steps on how to grip a putter, you will have good control of your putt. Dea owner, I have following your website something. I really benefited from your How to Grip a Putter Like a Pro article about golf. thanks a lot, for this idea.